Leading global marketing research services provider Civicom® is a featured commentary writer in the latest edition of the GreenBook Research Industry Trends (GRIT) Report. 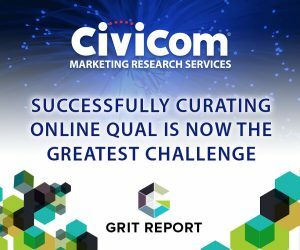 The GRIT Report is an invaluable exploratory and strategic guide drawn from a comprehensive survey on the market research industry. The recently released findings, derived from data collected in Q3 and Q4 of 2018, covers both traditional and innovative market research trends and challenges crucial to the progress of the sector. The latest edition of the GreenBook report tackles the evolving role of the modern researcher, adoption of emerging methods, and also buzz topics such as automation or AI, among many others. As a leading provider of marketing research services worldwide, Civicom continues to be at the forefront of developing solutions using the latest technologies to enhance the market research process. For the past few years, Civicom has consistently participated alongside industry experts in discussions, also spearheaded by GreenBook, on challenges and game-changers in the insights industry. West also writes that adoption of a video management and curation tool such as Glide Central™ is key in efficiently piecing together data and producing impactful reports, citing that solving the pain points of curating the overwhelming amount of video content from qualitative research is a significant issue researchers often find themselves tackling. The GreenBook Worldwide Directories is a project of the New York AMA (American Marketing Association) Communication Services, Inc., a wholly owned subsidiary of the New York American Marketing Association. GreenBook provides a listing of market research suppliers in two volumes. Volume One features companies that offer online advertising, brand and media research, and specialized research for major industries like financial, healthcare, retail, technology and telecommunications. The second volume features companies that offer focus group moderation, and qualitative research services such as recruiting, moderating, videoconferencing, internet broadcasting, usability testing, etc. The GreenBook online directory can be found at https://www.greenbook.org/. Civicom ThoughtLight™ works with both iOS and Android and is a useful tool for shopper insights, audio diaries and patient journeys. Civicom operates in over 96 countries and offers extensive translation services for marketing researchers, as well as transcription services through TranscriptionWing™, and market research respondent recruiting through CiviSelect™. Civicom Marketing Research Services and Schlesinger Group have now joined together in a strategic alliance to mutually serve the needs of clients needing web-enabled IDIs and focus groups combined with high quality recruiting services. All of these services are available in Spanish, as well as English, and multiple other languages. Glide Central™ is an online media management platform designed to solve the organizational pain points of digesting the overwhelming amount of video and audio that is generated during qualitative research. Glide eliminates much of the manual, tedious video curation process by efficiently streamlining every step within one platform. Researchers can view recordings, create tags, produce transcripts, make clips, and harvest key insights. Accelerate your analysis and improve the turn-around time of delivering impactful reports. Glide Central was developed by Civicom Marketing Research Services with the overburdened research professional in mind.